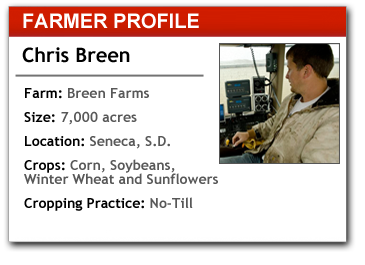 Chris Breen, who farms with his father, Pat, is in charge of most of the precision technologies used on their South Dakota farm — which encompasses most all of their equipment. Automatic steering with RTK is used on every piece of equipment from tractors to sprayers to combines — which has helped reduce the time it takes to harvest. Both their Kinze and Great Plains planters have two-row automatic row shutoffs and their sprayers have auto-swath. Precision is also essential for the use of their Exactrix, TAPPS formulation fertilizer application system. Because the Breens want to use twin-row planters — and there’s just not enough room on the planter for the specialty fertilizer system — they’ve created a custom 60 foot Case SDX fertilizer rig to put down the Exactrix blend ahead of planting on 15-inch centers. The key is being able to return to plant the twin-rows centered over the center of the strip. “With the Exactrix system we’re able to use less fertilizer and we save from $30 to $70 per acre over dry or liquid fertilizer with application costs,” Breen says. So it’s important for them to be able to use it accurately. With one Great Plains planter, one Kinze planter, the Exactrix system and John Deere tractors, there are a lot of systems and programs that have to speak to each other to make it all work. This includes the TeeJet electronic control unit that controls the rate of the two products put down with the Exactrix system. Breen was able to keep all the systems on one monitor by using a John Deere 2630 display communicating with the various implements through ISOBUS. When setting up their new Exactrix-equipped implements they ran into a snag. After two days of tweaking and more than an hour on the phone, they finally figured out they had two wires crossed. 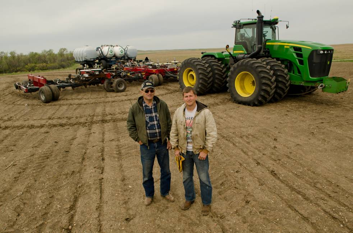 Pat and Chris Breen with their custom Horsch Anderson fertilizer applicator setup with the Exactrix system. He believes it’s something that more training could solve. But another issue may take some consideration from the software providers. Even with ISOBUS, Breen finds that some system software doesn’t work well with others. So when he gets his system to work just right, he doesn’t want to change it. This creates problems when it comes time to update software. Software updates that are better vetted to make sure they work with other programs may be one solution. Or possibly more communication with dealers and growers about needed updates so all systems are running with the latest tweaks. For now, Breen doesn’t have a solution other than knowing how to uninstall an update that sends his system into a tailspin.